We've just come through 13 days of temperatures below 20°F (-7°C). In fact, a week ago, it was -13°F (-25°C) when we got up in the morning. Brrrrr! Although Doug and I are perfectly content to stay home during these cold days, there are times when going out can't be avoided. 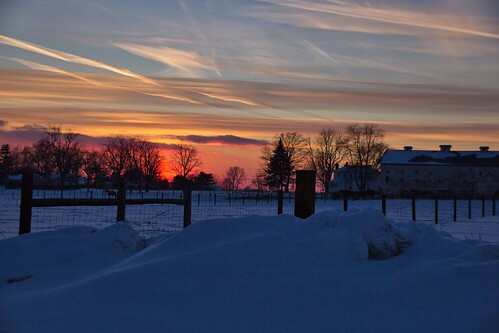 When we ventured out to run some errands on Saturday, we were rewarded with a lovely winter sunset. We're currently experiencing a bit of a warm-up, for which we're grateful. But, at this time of year, we know it's only a temporary reprieve. 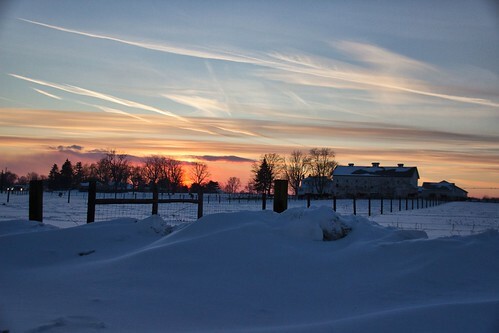 Your photos are beautiful, but the temperatures are much too low for me. We've had very cold weather as well, but not quite as bad as what you've endured. I'm ready for Spring! Same here, Linda.... VERY VERY cold --but we are experiencing temperatures above freezing right now (at least for a few days).... Your sunset pictures are absolutely gorgeous. You ought to frame one of those.... I love them. Thanks, Betsy. I didn't feel that my photos did justice to the sunset, but I'm glad you enjoyed them. You know how that is...the majesty of a sunset is seldom fully captured in a photograph. I can't imagine how frigid it was in your neck of the woods, Linda. Even here in the foothills it was very cold with temperatures down to a single digit. We're tickled for the change and looking forward to 52°F today. 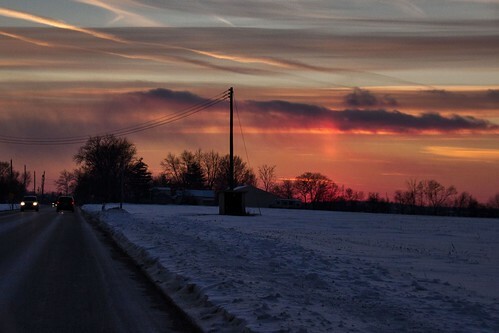 Your photos are really gorgeous, and I love seeing mare's tails in the sky. When you're out in the woods in the winter, you need to keep the early nightfall in mind, don't you? I'm glad you made it safely back to your car last night. The colours of the sunset are magnificent, Linda, beautiful photos. I can tell you that -25°C sounds like real winter to me, I haven't experienced such low temperatures yet! That temperature FELT like real winter, too, Petra! I didn't venture out at all that day. Thanks always for the kind words about the photos. That sunset is gorgeous.It is quite mild here now but colder weather is coming again soon. Well, Dianna, when you get below zero, six degrees doesn't make much difference. We can just agree that it was cold! Your forecast sounds very similar to ours except that I'm not sure we'll get out of the fifties before the cold returns. Thanks so much for the sweet praise of my pictures.